On the first of September, Venus and Mars were meeting in the sky and they will be very close together until November, when they meet again. Integrating the feminine and the masculine vital life force = universal love making love with life. We now have a huge opportunity to integrate these aspects and the effect is delicious! The integration of the two parts of our nature, the masculine and the feminine, makes us feel nourished by the energy of the earth, and through it, the whole cosmos. The cells in the body becomes well sustained. state. The true root of beauty. BEcoming healing for people around us, if they say YES in surrendering to the vibration. Unconditional loving relationships – both with men and women, because it will not be based on needs. Being + Being = ONE. In a sexual relationship, one can play with the attraction between the masculine and feminine polarities. It’s a whole new experience to experience a union between two ’BE-you-to-fully’ beings. A divine blessing. I’ve never experienced my femininity as much as I do in my relationship with my man. I wish for every woman and man to taste the sweet nectar, which unleashes when a woman lets the masculine energy penetrate her core, and when the man receives her whole being. Every moment IS love loves, and love making love. In friendship it expresses more like sisterhood and brotherhood. A sacred space you ARE for each other’s feminine (sisterhood) and masculine side (brotherhood). It’s such a blessing to have my best siSTAR living next door. 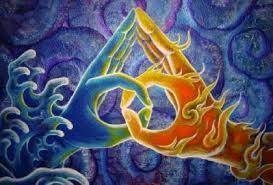 The integrated harmony is not just reflected in the personality and the behaviour, but also in each person’s cell. When a sperm and egg unite they die to create the zygote. Full death means that the emotional ties to our parents cease to exist. Then we become our own parent. By parenting our self we become trans-parent. We become the author of our life, the authority and the experience is living life ONE intending. You and the life force want the same – a sign of no separation between the Spirit and the human Self. I can confirm all these happenings as I experience them all right now. Saying YES to embody the feminine energy totally changed my experience of life as it integrated with the masculine power. I’m overflowing with LOVE that resonates Life IS. Celebrating the union within and with my man. Client after client come with the yes to awaken the divine feminine power. The other week one woman got her period back after 4 years of not having one – and it changed her whole being so she has to realign her whole business. If this loving lifeforce union is knocking on your door, then I am happy to BE a catalyst in an activation session.